The latest hardware/software configuration of Sony's game console will be themed around the movie adaptations of J.K. Rowling's mega-popular boy wizard. 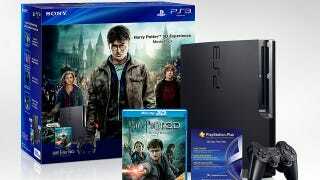 $250 gets you a 160 GB PS3, a 2D/3D Blu-Ray of Harry Potter and the Deathly Hallows, Part 2 and a voucher to download the first two films in the series. On the games side, you'll also get a thirty-day trial for PlayStation Plus. Sounds like Sony's trying to double down on the PS3 as 3D entertainment as their new PlayStation 3D Display goes out onto store shelves.